Like many dentist equipment in dentistry, air polishing has changed since the late 1970s. There are several new air polisher designs and new abrasive powders, and we now have the ability to use air polishers subgingivally. Sodium bicarbonate was the original abrasive powder used, but newer abrasive powders include glycine, calcium carbonate, calcium sodium phosphosilicate, aluminum trihydroxide, and erythritol. These additional powders give us more choices for our patients' individual needs. 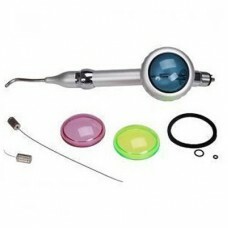 Indications for use of an air polisher have typically included extrinsic stain removal, cleaning around orthodontic appliances, and to clean occlusal surfaces before placing a sealant. Now there are indications for use on exposed, hypersensitive dentin and periodontal pockets. The benefits of air polishing for the dental professional include less operator fatigue, less time involved than the traditional polishing technique, and improved access to difficult-to-reach areas. Benefits to the patient include less time in the chair, less "scraping," excellent stain removal, reduced dentin hypersensitivity, and improved periodontal status.